Let’s look four examples of Israeli appeasement. In 1947, the UN took up the issue of partitioning the remaining 25% of the land. The UN plan called for roughly 5,500 square miles to become a Jewish state. The rest was to become an Arab state. This meant the Jews would receive a mere 12% of the original land promised in the Balfour Declaration. In spite of failing to receive 88% of what was originally promised, and in an effort to appease the Arabs, the Jews accepted the plan. On November 29, 1947 the UN approved the partition of two separate states. I call this the ‘original two-state solution.’ The vote passed by a 72% majority. 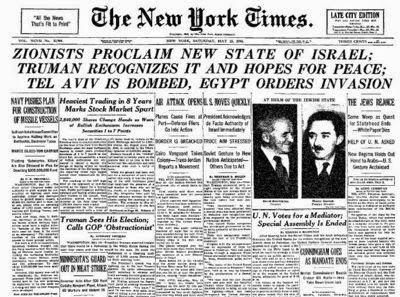 However, the Arabs rejected the UN vote and one day after Israel declared independence in May 1948 the surrounding Arab nations attacked trying to destroy it. So much for appeasement. The Oslo Accords were a series of agreements between Israel and the Palestinians signed in 1993. Israel was willing to turn over self-rule to the Palestinians in selected areas provided they curbed terror attacks against innocent civilians. The more the Palestinians refrained from terror, the more self-rule they would be granted. However, they didn’t abide by the agreements and kept up the terror attacks. Subsequent to Prime Minister Yitzchak Rabin’s assassination in 1995 the Oslo Accords started to collapse. Between 1994 and 2000 terror related deaths averaged 52 per year. With no end of terror in sight Israel was forced to take direct measures to protect its civilians. A decision was made to construct a security barrier largely along the 1949 Armistice Line. Construction began in 2000. During the building of the first phase of the barrier between 2000 – 2003 terror deaths jumped from 52 up to an average of 290 per year. (one every 33 hours) After the initial section of the barrier was completed terror deaths dropped dramatically. However, the message was clear. The Arabs’ broken commitment to abide by the Oslo Accords was responsible for another failed attempt at appeasement. For years the Palestinians kept accusing Israel of “occupying Gaza.” In 2005 Prime Minister Ariel Sharon made a decision to evacuate the Gaza Strip. It was one of the most difficult decisions any Israeli leader has ever made. After a 38 year presence the government forced the Jews to leave their homes. Israel was in complete turmoil over it. The country came to the brink of civil war. There were gut wrenching images of Israeli soldiers physically forcing Jews out of their homes. During the three years leading up to Israel’s evacuation, (2003 – 2005) the average number of terrorist rocket attacks fired into Israel from Gaza was 955 per year. Subsequent to Israel’s withdrawal elections were held in Gaza in 2006. The terrorist organization Hamas won a majority. The following year after ongoing battles with the rival Fatah Party, Hamas staged a violent take over and forced Fatah out of Gaza. During the three year post election period (2006-2008) rather than committing to peaceful coexistence Hamas thanked Israel for withdrawing by more than doubling the yearly average of rockets from 955 to 2276. (6 per day) Imagine living under such conditions. Since Israel’s unilateral withdrawal from Gaza, they have been forced to fight three defensive wars with Hamas (2009, 2012 and 2014) due to relentless rocket attacks against its civilians which have exceeded 11,000 since 2005. Once again appeasement has proven useless. In June 1967 Israel defeated Syria, Jordan and Egypt in what is generally considered the most decisive military victory in modern history. During the lightning fast war Israel was able to secure strategic territory in the Golan Heights. These mountain top locations had been used by Syria for years to rain terror down on Israeli civilians below, forcing them to spend endless nights in bomb shelters. Israel’s victory took that daily threat away. Israel also captured the Sinai Peninsula and the Gaza Strip from Egypt. Eventually the Sinai was returned as part of a peace agreement between the two countries. We’ve already discussed Gaza. However, the most significant gain was securing the Old City of Jerusalem. This gave complete control of the Holy City to the Jewish people for the first time since the days of the Roman occupation. Judaism’s holiest site, the Temple Mount was once again in Jewish hands. However, Israel’s military leader Moshe Dayan made a decision which would have repercussions that are being felt to this very day. In spite of the indisputable connection Jews have with Temple Mount, Dayan, who many considered a hero, gave the store away. He chose to appease the Muslims by turning over control of Judaism’s holiest site to the Jordanian Muslim Waqf. They have custodial care of it to this day. That decision has resulted in constant tension and violence over the years. Since the Six Day War, up to and including today, the Muslims have engineered a revisionist campaign denying any Jewish connection with Temple Mount or Jerusalem. This is spite of the fact that the “Official 1925 Supreme Moslem Council’s own guide book to Temple Mount confirms its historical Jewish connection. Looking back one can only conclude Dayan’s attempt at appeasement has been yet another dismal failure. As long as Muslim children are raised in a culture where they are taught murdering Jews is a holy duty, appeasement only serves Israel’s enemies. To read more of Dan Calic’s articles see his Facebook page.